Is It Still a Book if it Hasn't Been Bound? A codex (plural codexes or codices) is the technical name for an ancient book or manuscript, specifically one that was published before Johannes Gutenberg's invention of the printing press in the mid-15th century. Some of the most famous books in our world appeared long before Gutenberg, such as the Koran and the Torah, the Bhagavad Gita and the Mabinogion. Those are found stored in museums throughout the world. But typically the term codex refers specifically to the books of the prehispanic Mesoamerican civilizations, including Maya, Aztec and Mixtec. There were certainly dozens if not hundreds of prehistoric American books: most were burned during the Spanish Conquest of the Americas, but a handful have survived. What Are Codexes Made Of? Prehispanic codexes were made outu of animal skins or bark paper, called amate. Amate, from the Nahuatl word amatl, was made from the bark of mulberry trees. The paper was made into long sheets which were then folded like an accordion (called "screenfold") into books of rectangular or square pages. Codexes were painted with a wide range of vivid colors, mostly natural pigments such as calcium carbonite for white, ochre or hematite for oranges and reds, cochineal for red, and carbon or lamp black for black. A created pigment archaeologists call Maya blue. made from a mixture of palygorskite and indigo, was used for blues, greens and grays. What Were the Books About? Prehispanic books covered a variety of topics written in hieroglyphic texts, dates and pictures. Astronomical sections included star charts, eclipses, equinoxes and solstices; almanacs detail the annual calendars for rituals, ceremonies and agricultural practices; historical and/or divinatory passages documented the families and battles of rulers. Identifying when the codexes were made has been difficult: radiocarbon dates are problematic, and although there are dates written on the documents, they go backward and forward through time. Currently, scholars are inclined to place the dates of construction between the 12th and 16th centuries AD. See Vail 2006 for an interesting discussion of dating Maya codexes. The most complete and stunning codex from the prehispanic period, in my opinion, is the Madrid Codex or Codex Tro-Cortesiano. It has 112 pages and was made from a 6.8 meter (22 foot) long strip of bark paper, folded to rectangular pages, each about 22.6 centimeters (8.9 inches) high and 12.2 cm (4.8 in) wide. 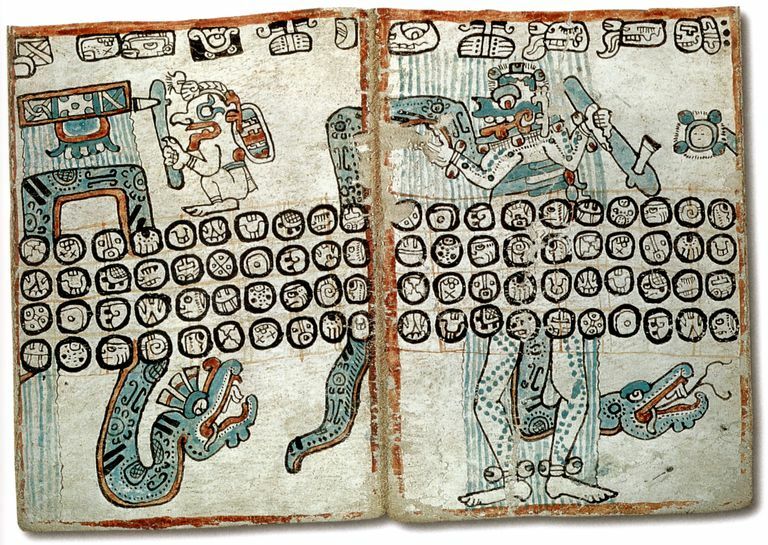 The Madrid codex includes 243 sections on a huge range of topics including things such as beekeeping, deer hunting, carving deity images and the rain ceremonies of the Maya god Chaac. The Dresden Codex was probably painted after the 13th century and contains 74 pages made of barkcloth. Dresden has the most complete astronomical information of any of the Maya codexes, including the transit of Venus and how to correct it, lunar eclipses and a calendar based on planet movement, prophesies and gods and ceremonies. The Codex Colombino deals with the life and conquests of the 11th century Mixtec ruler known as 8 Deer Tiger Claw. The Codex Porfirio Diaz is a polychrome screenfold from the Cuicatec region, dating to the early 16th century, on deerskin. It records a series of conquests, ending with an important political marriage of the lord of Birdhill and the daughter of the lord of Butterfly Snake Mountain. The Codex Cospi is a divinatory book from the Mixteca-Puebla area of central Mexico, begun during the Late Postclassic period (1350-1521) and perhaps added to in the early Colonial period. It includes five long deerskin strips joined to a length of 3.64 meters and screen-folded to form 20 pages, each measuring 18x18 cm (7x7 in). Four different sections including a complete divinatory calendar; images of Venus as the Morning star. The Florentine Codex includes 12 books on aspects of Nahua language. It was commissioned by the Spanish friar Bernardino de Sahagun and painted in 1579 by Nahua speakers, who recorded information on ancient gods and sacred ceremonies. The text includes Nahuatl and Spanish in parallel columns. Bricker HM, Bricker VR, and Wulfing B. 1997. Determining the historicity of three astronomical almanacs in the Madrid Codex. Journal for the History of Astronomy Supplement 28:17. Buti D, Domenici D, Miliani C, García Sáiz C, Gómez Espinoza T, Jímenez Villalba F, Verde Casanova A, Sabía de la Mata A, Romani A, Presciutti F et al. 2014. Non-invasive investigation of a pre-Hispanic Maya screenfold book: the Madrid Codex. Journal of Archaeological Science 42(0):166-178. Miliani C, Domenici D, Clementi C, Presciutti F, Rosi F, Buti D, Romani A, Laurencich Minelli L, and Sgamellotti A. 2012. Colouring materials of pre-Columbian codices: non-invasive in situ spectroscopic analysis of the Codex Cospi. Journal of Archaeological Science 39(3):672-679. Park C, and Chung H. 2011. Identification of Postclassic Maya Constellations from the Venus Pages of the Dresden Codex. Estudios de Cultura Maya 35:33-62. Sanz E, Arteaga A, García MA, Cámara C, and Dietz C. 2012. Chromatographic analysis of indigo from Maya Blue by LC–DAD–QTOF. Journal of Archaeological Science 39(12):3516-3523. Terraciano K. 2010. Three Texts in One: Book XII of the Florentine Codex. Ethnohistory 57(1):51-72. Vail G. 2006. The Maya Codices. Annual Review of Anthropology 35(1):497-519. Vail G, and Hernández C. 2011. The construction of memory: The use Of Classic Period divinatory texts in the Late Postclassic Maya codices. Ancient Mesoamerica 22(02):449-462.
van Doesburg B. 2001. The Codex Porfirio Diaz and the map of Tutepetongo: The curious relationship between pictography and glosses in Oaxacan screenfolds. Ethnohistory 48(3):403-432.